Ciwt had never seen this painting which is included in the Dutch Masters show now up at the National Gallery of Art in DC. And it made her smile when she did. How daring was Mr. van Hoogstraten! The majority of Dutch genre paintings are of women at home almost always reverently attending to domestic matters like sewing, writing, sitting quietly and patiently with dogs and children. There is never a thing out of place or a speck of dust in sight, and the strong suggestion is that this humble, practical paragon of womanhood is responsible for all the perfect cleanliness. 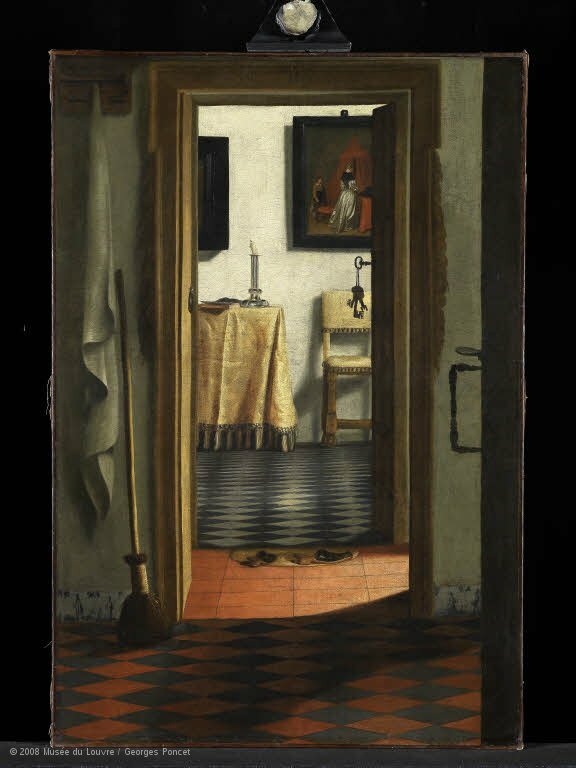 Enter van Hoogstraten who shows the viewer a scene from a domestic's point of view. Broom leaning against the waall, light in the corridor, door to the main house open. So where is the mistress? Clearly not cleaning. Is she home? If so, is she alone? Who is with her?